Cathie Rowand | The Journal Gazette Veteran Fort Wayne air traffic controller of 16 years, Eric Vanstrom, assisted a pilot and co-pilot of a small plane to ensure a safe outcome to a dangerous situation. The National Air Traffic Controllers Association honored Vanstrom with its highest honor, the Archie League Medal of Safety Award. A Fort Wayne air traffic controller has received a national award for providing a dramatic "flight assist" to a pilot who had lost all instrumentation and was in danger of crashing during a storm here last year. Eric Vanstrom, who has been an air traffic controller for 16 years, received the Archie League Medal of Safety Award, the highest honor of the National Air Traffic Controllers Association. It's named after the first air traffic controller. He received the award recently in Las Vegas. 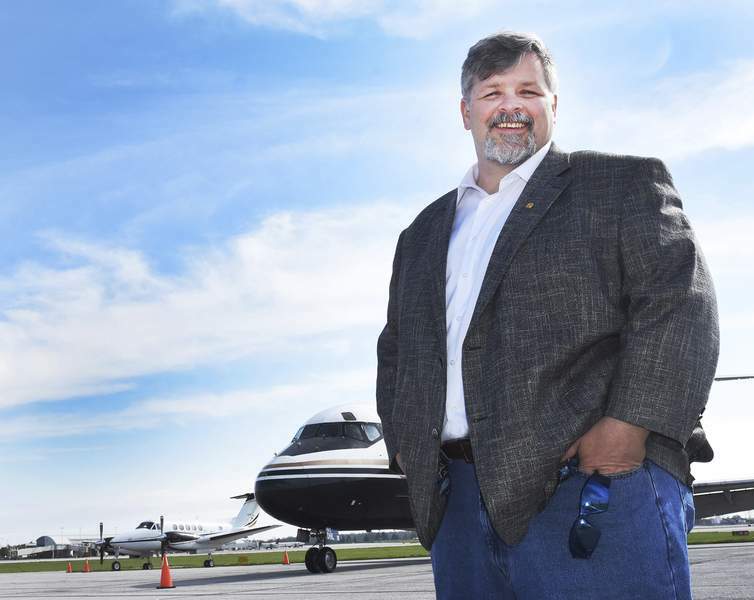 Last May an Iowa man, Kevin Knutson, was flying a single-engine Piper from Philadelphia to Cedar Rapids, Iowa, and his flight plan called for him to land in Fort Wayne and refuel. When he arrived in Fort Wayne, though, it was dark and a severe storm had developed. Just then, at the worst possible time, what is called the gyro, or vacuum system, went out on Knutson's plane. That left him with no accurate instrumentation – no compass, no way to tell whether he was climbing or descending, no way to navigate and no accurate information on his altitude. He could have found himself flying upside down in a cloud and not known it. Knutson didn't know it, though. There is no light on the dashboard that tells you "gyro is out," he said, so he didn't realize all his instruments were wrong. At one point, Knutson said, he thought he was flying at 360 degrees, due north, when he was actually flying at 180 degrees, due south. It was Vanstrom who noticed the plane's erratic flight, so he contacted the pilot. "You're flying in circles," Vanstrom told Knutson in a recording of the ordeal. "I need to get you away from Fort Wayne to take you south." Over the course of two hours, Vanstrom told Knutson what his heading was, what his altitude was, and told him when to start and stop turns to get on new headings. Vanstrom had to shepherd Knutson through the sky because Knutson's compass was no good. Gradually Vanstrom led Knutson to the Portland airport, where the weather was clearer, had Portland turn on its lights, and guided Knutson to a landing. "The air traffic controller did an incredible job of helping," Knutson said. "I owe my life to this guy. I wouldn't be here without him. I commend him. I'm pleased he got the award. He more than deserves it." Vanstrom, in an interview at the Fort Wayne Aero Center Tuesday, said the fact that Knutson remained calm and didn't get distressed helped a lot. He's also pleased that the award brings a little bit of national recognition. "It puts Fort Wayne on the map. We can do what everyone else can do," Vanstrom said. Knutson said it was later determined that his entire gyro system had gone out, even though it was relatively new, so he had it replaced. By the way. He also sold the plane and got a new one.